It’s hard to imagine the bow and arrow could be improved any further than its modern incarnations, but somehow manufacturers continue to find a way. The Archery Trade Association is holding its annual convention in Lousville, Kentucky this week Jan 5-7. The event marks the 20th anniversary of the conference, which has grown now to 615 exhibitors. The floor plan of the convention hall at 229,000 square feet is enough to fill the flight deck of the Harry S. Truman aircraft carrier. 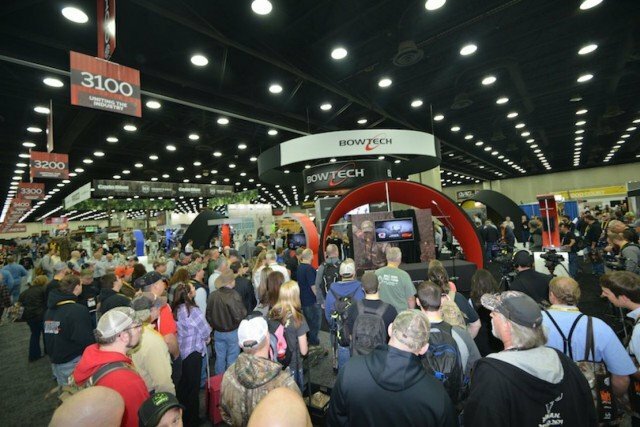 Drawing widespread attention on opening day was Bowtech, which unveiled its new line of bows for the 6th straight year at the ATA. A crowd of 500 people spilled into the aisles with anticipation of its flagship bow this year named the BT-X, which features 10 micro settings for precise tuning and PowerShift technology. The 28-inch version delivers speeds of 333 fps and the 31-inch model delivers 350 fps., according to a press release. The precise capabilities and light-weight designs in today’s modern bows show how far technology has come, but it still requires great hand-eye coordination to shoot straight. Giants pitcher Hunter Strickland said growing up bowhunting in Georgia has helped him become a better pitcher. Across the country, participation in archery is at an all-time high. A recent survey by the Archery Trade Association found that 9.2 percent of people 18 years or older in the United States consider themselves archers. Factored over 235 million Americans and that’s 21.6 million potential archers. “The bottom line is that we have about 11 to 12 million bowhunters in this country, but they range from casual to fanatical in their interest, so they aren’t all hunting in any given year,” said Jay McAninch, the ATA’s president and CEO.